Audi A7 piloted driving concept “Jack” has gone back to school. Learning to be more adept at operating like a human driver, the car's autonomously performed motorway driving manoeuvres have been further refined and it is ‘now even more proficient at showing consideration for other road users’. 'Jack' exhibits a driving style that is adaptive to the given situation, safe and interactive – it is a research car with ‘social competence’ says Audi. Now driving more naturally, Jack confidently deals with hazardous points on the road, passes trucks with a slightly wider lateral gap and signals upcoming lane changes by activating the indicator and moving closer to the lane marking first – just like human drivers would do to indicate their intentions. The 'cooperative attitude' of Jack is also apparent when other vehicles want to merge into its lane on the motorway. Here the test car decides – based on the selected driving profile – whether to accelerate or brake, depending on which is best suited to handling the traffic situation harmoniously for all road users. The super brain of piloted driving is the central driver assistance controller, or zFAS. It uses state-of-the-art, high-performance processors to evaluate the signals from all sensors in real-time and create a model of the car’s surroundings. This model represents the prevailing traffic situation as accurately as possible. Audi continues to document its progress in piloted driving with spectacular events. In the United States, for instance, a driverless Audi TTS etched the brand’s four rings trademark into the surface of a salt flat and also conquered the legendary hill climb up Pikes Peak in the Rocky Mountains without a driver. In the future, information on variable-message traffic signs, for example, will be digitally transmitted into the car in order to assist the traffic flow. In addition, Audi is testing elements of the future communications standard 5G together with IT partners. Car-to-X communication immediately enables piloted driving cars to use paved road shoulders when these are temporarily opened. Another step forward is Car-to-Car communication between automobiles that are travelling on the same routes. They can report on hazardous points and accidents in real time. The driving speeds of other road users operating with piloted driving are then automatically adjusted to the potential hazard. Audi is in a research and development phase of a so-called “first mile” in Bavaria, near the redesigned autobahn exit “Ingolstadt-Süd.” From 2017, Audi – together with the city of Ingolstadt – will be testing construction methods such as the use of different types of pavement as well as technical solutions such as the use of sensors in junction zones. 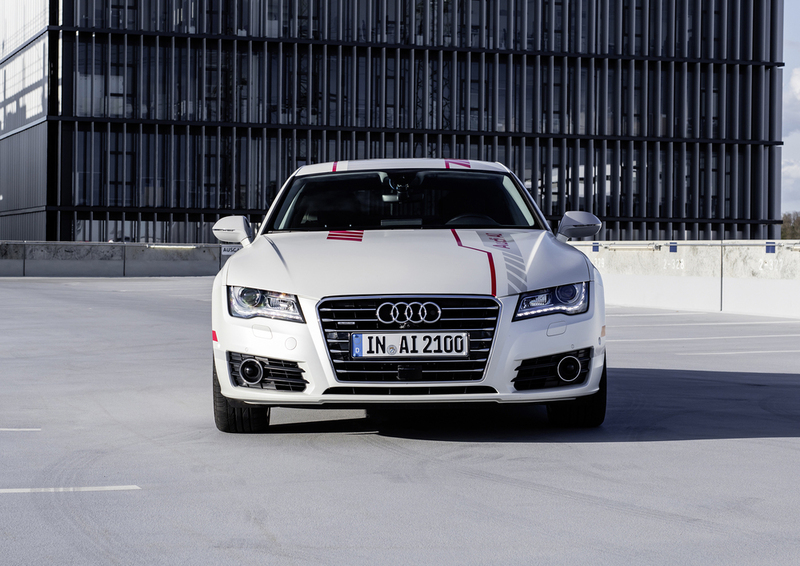 Piloted driving research cars from Audi are already being incorporated into the design of the new infrastructure. Test operation should begin in 2018.